Transport planners, architects, social NGOs, development agencies, students and teachers came together at the beautiful Sanskriti Kendra in Indian capital New Delhi, for a mapping exercise aimed at understanding how transport points served walkers and cyclists so that solutions could be found out to make walking and cycling in cities safer and comfortable. Hosted by Clean Air Asia with the support of the ‘Steer to Safety’ campaign of PVR Nest, the corporation social responsibility arm of multiplex chain PVR Limited and an NGO, the exercise was conducted by a team representing University of Michigan, USA’s SMART (Sustainable Mobility & Accessibility, Research & Transformation). Led by Susan Zielinski, MD of SMART, the half-day mapping exercise was attended by over 30 participants, who were divided into three teams to give a balanced background. 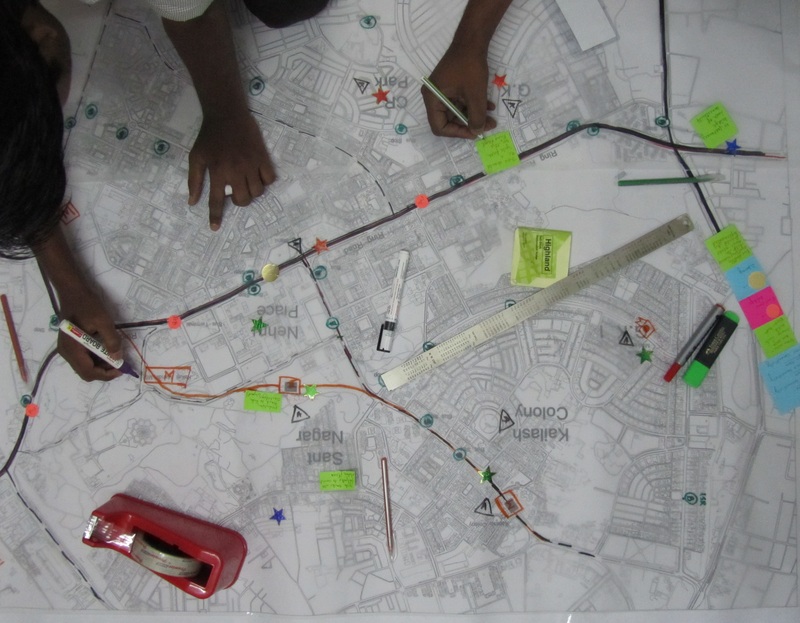 In the exercise, the participants were asked to look at a map to understand how the different transport points such as metros, bus stops, auto stands and cycle rickshaw stands are connected. The exercise enabled them to realize how the transport points could be better connected and what the possible improvements are. All the participants were given an hour’s time, first to mark the existing features on the available map, and then work on a set of questions, which would help them develop the solutions. The teams were provided stickers and markers and allowed to choose a timekeeper and reporter. Within the existing network mapped by them, what are the immediate “low hanging fruit” ideas and opportunities to improve the basic walking and cycling situation in the city? What are the benefits of the public transport facility and how can they be linked better to other modes such as cycle rickshaw and even walking and cycling? How can the government, entrepreneurs, NGOs and stakeholders be better engaged to carry forward your ideas? What information or other technologies could support these ideas? How will you promote your ideas? What new business models or innovations or financing will help you implement your ideas? “The teams came up with excellent views ranging from developing apps that aid public transport to providing better information to make mobility better through large display boards,” said Ms Zeilinski, who was impressed by the seriousness shown by the participants. 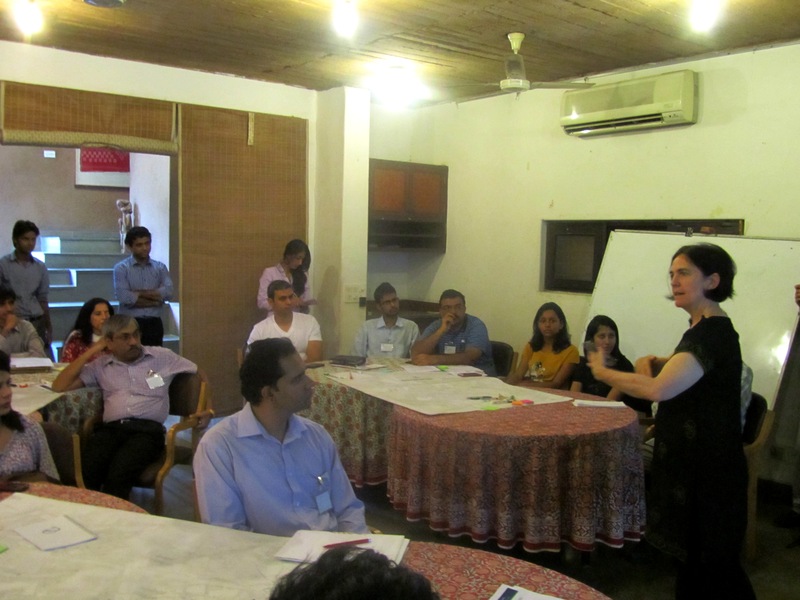 “It was a great brainstorming session,” said Sameera Kumar of Clean Air Asia. “The participants displayed their sensitivities to the precarious transport situation by coming up with ideas to make street networks better. The suggestions included improving safety of women through better transport designs and making it mandatory for parents to send their children only by school buses to reduce congestion on the roads,” he added.